Morning Minutes is a project I've been working on for several years. Each track was made in a day, usually in less than an hour. The impetus behind the project is both therapeutic–the idea to make a short track each day without thinking about it too much–and practical–I enjoy listening to my own music, especially while driving, and these short tape pieces proved to be excellent driving music. Don't listen for too much to happen. But it's not ambient. Good for driving, cleaning, especially driving. I didn't want to compose. The composition was subconscious. The tracks are arranged in the order they were made. I subconsciously composed the flow. There are three volumes. You can also listen on shuffle here. All tracks were made on a Tascam 464 four-track cassette recorder. Other instruments used: Juno 60, electric guitar, bass, and turntable. No computers were used. All loops are made in real time by placing a guitar slide in front of the turntable arm to make a skipping loop. I had a reverb pedal and a distortion pedal as well. And sometimes delay and fuzz and one other effect. I wrote three pages of words each day before making the tracks. I also took a screen shot of the Rockaway surf cam every day after making each track. I would usually listen to these tracks on the drive out to Rockaway to go surfing. I really enjoy listening to these tracks. I hope you enjoy them too. 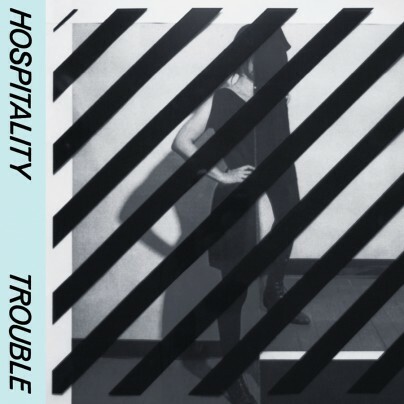 On its self-titled debut, the charming Brooklyn pop-rock band Hospitality burst out of the gate like a batch of 4.0 GPA indie-rock students, not unlike their forerunning New York City bros in Vampire Weekend. With songs that crushed out on coworkers and wrapped heartache in cheap dresses, frontwoman Amber Papini managed a balancing act of post-collegiate insouciance and soul, channeling The Velvet Undergound's prettier moments with knowing, Belle & Sebastian-style naivete. More than one observer described Hospitality by invoking a cardigan. Here's some classical music I wrote. With a debt to Stravinsky, my harmonic language often searches for the "right wrong notes." In Shelter, for example, a simple melody drifts through the ensemble in canons of varying distances, creating a hovering, mobile-like music that is largely tonal, with occasional flares of dissonance. And in Piece With Rising and Falling a propulsive left-hand ostinato provides a musical straight-jacket out of which the right hand melody tries to escape. I play the piano on tracks 5 and 6 and recorded the performances on cassette, though the recordings (ironically) sound like midi. I played bongos in my first band. I was around 8 years old. Then I moved on to a cardboard drum set that my dad built me. The cymbals were made of thin metal sheets. The kick pedal beater was a tennis ball. Next, I picked up the guitar. Open E minor was the first chord I learned. It's still my favorite. Inspired by the Beatles and Neil Young, I started recording my own songs on a 4-track under the name Poor Cow.